Jelly On the Plate, Jelly on the Plate, Wibbly Wobbly Wibbly Wobbly Jelly on the Plate!!! I've never been a fan of molded jelly but last night i made this and it totally changed my mind! No longer should these desserts be left to linger in the midst of the 50's faux pas! Add 3/4 of a cup of Peach Basil Simple Syrup, Juice of 1 lime and 1 cup of boiling water stir until gelatine is dissolved, set aside in the fridge until the mixture becomes the consistency of egg white. In the other bowl add 1 cup of boiling water to the softened gelatine, Stir until gelatine is dissolved and add 1 can of sweetened and condensed milk and the juice of 1/2 a lime. When both jelly mixtures have become sticky and more viscous you can begin filling the mold. 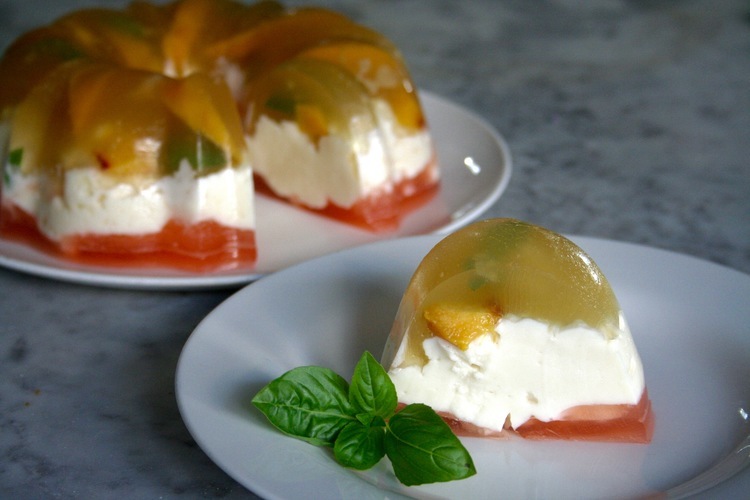 Begin by placing the peaches in the mold, by adding some jelly and then more fruit and basil leaves you will achieve a suspended effect. Then layer on your opaque mixture Let set up in the fridge overnight and in the morning unmold this delightful dessert.